August | 2015 | Small Farmers. Big Change. While Yvon Chouinard is talking about prairies and their link to a healthy ecosystem in this particular excerpt, the principles apply to the coffee farmers in our supply chain who grow coffee in mountainous tropical forests. 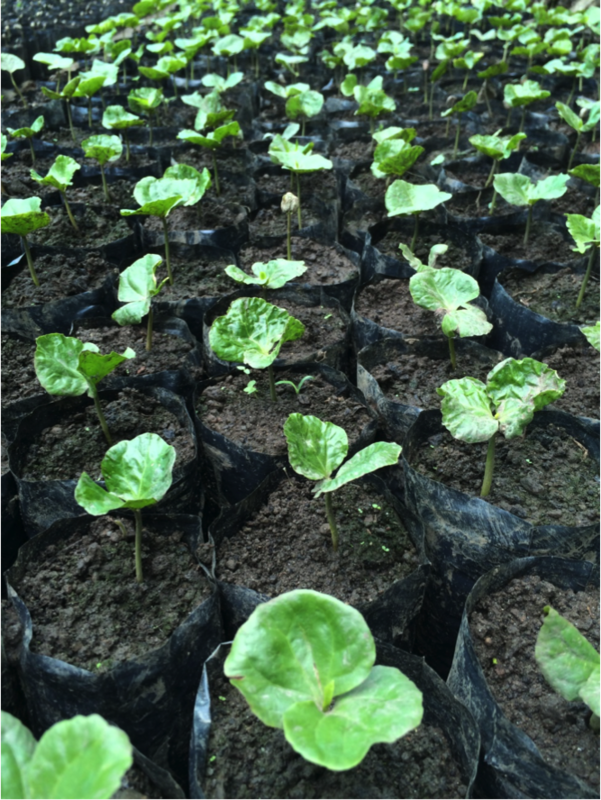 Coffee farmers in the Equal Exchange supply chain are pursuing an idea of regenerative agriculture with a strong focus on recovering soil health. 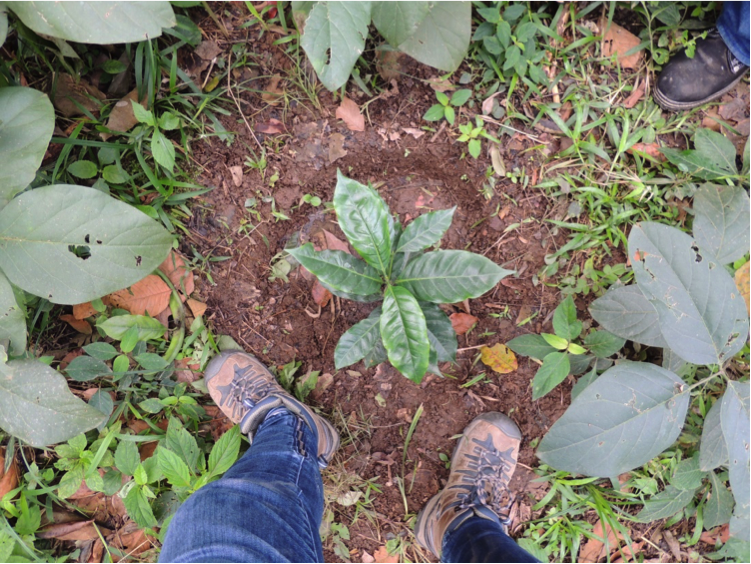 During a trip to Riosucio, Caldas, Colombia in July, Beth Ann Caspersen, Equal Exchange coffee quality manager, and I got to experience some of the regenerative soil action that is happening in organic coffee production first hand. 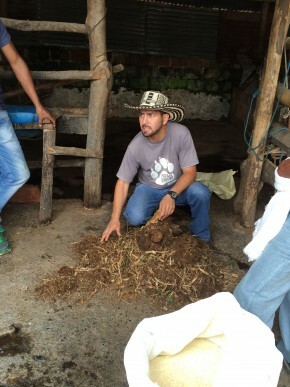 Fredy Pérez Zelaya, a farmer and member of Café Orgánico Marcala S.A. (COMSA) in Marcala, Honduras, traveled with us to participate in ASPROCAFE Ingrumá’s annual farmer fair, and shared his experience with microorganisms. Fredy trained and studied as an agronomist in a very traditional program that emphasized conventional agricultural practices and interventions to maximize productivity. However, he had a powerful shift of life philosophy in the early 2000s and was a founding member of COMSA, an association of coffee growers who share the belief that organic agriculture was the only option to truly prosper and progress as coffee farmers. As the members of COMSA experimented on their farms and exchanged ideas with other growers, their organic philosophy grew and grew. Today, they emphasize the 5 Ms: organic Material, Microorganisms, Minerals, living Molecules, and gray Matter (or brain power) as the foundation for their organic vision. Microorganisms are the billions of bacteria, fungi, yeast, etc. that live in soil and have a positive impact on decomposing organic matter and building healthy soil. All five of the Ms relate fundamentally to soil health and that brings us back to the wonderful words of Yvon Chouinard about how we must double down and focus on soil if we want to talk about regenerative and organic agriculture. For years now, our small farmer co-op partners have been struggling to keep their land, continue farming, supply us with high quality products, provide food for their families, and earn a dignified livelihood. They have to do this for the most part without support from public or private sectors. Governments have generally disinvested in agriculture, particularly small scale agriculture, banks don’t lend to campesinos or small-scale co-operative enterprises, resources for training and technical assistance are virtually non-existent. Now, due to unpredictable climatic changes, they now have to do all this and do it while confronting droughts during the rainy seasons; frosts during the summer seasons; excessive rainfall during the dry seasons; hurricane-like winds that blow fruit off the trees; unusually high tides that salinate farmlands; and so on; and so on. On a positive note, organic agriculture has been receiving attention for its contribution to healthy farms, people, and food. Recently we are also beginning to hear more and more about the benefits that micro-organisms play in soil productivity, and the benefits that soil plays in sequestering carbon from the air….. all this gives us new hope that strategies do exist to reverse climate change…. 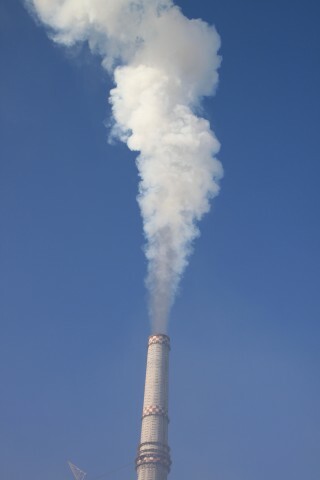 We just need to learn more about the way that small scale producers are caring for the soil, water, forests, and eco-systems, support them in their efforts to steward the environment, and take action here in the North to stop polluting our resources and spewing more carbon dioxide into the air. In the following article, Ronnie Cummins, Director of the Organic Consumers Association, writes about the power of regenerative agriculture to solve many of the crises we face today. Yesterday, Lincoln Neal wrote about last week’s arctic drilling protest on Portland’s Willamette River. This morning we hear another account of the demonstration…. this time from one of the kayakactivists, Equal Exchange’s Meghan Huebner. I was offered a seat in a kayak and given a large Alaskan flag to hold. I happily jumped in, eager to see the action on the water. Soon after, I saw Jim and Casey in a canoe that they had found on the beach. They were paddling with the top of a Tupperware container and a two by four but ended up acquiring a couple of paddles abandoned by other activists who had been arrested. 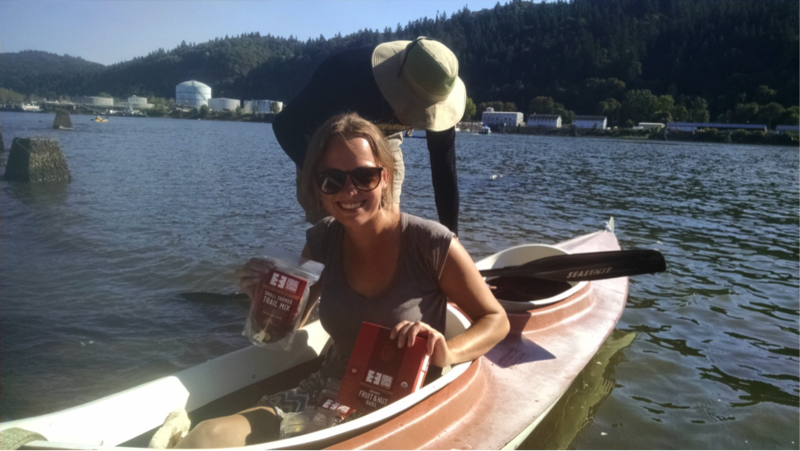 We were paddling around passing out Equal Exchange goodies and listening to the strategies of the protestors. The main plan once the ship was close enough, was to swarm towards the center of the river and create a dense wall, making it difficult for the ship to pass and more challenging for authorities to reach everyone. After only 20 minutes on the water, we could see the Fennica moving steadily closer. As the ship neared the bridge, kayakers were doing all they could to dodge the police and Coast Guard and form a barrier. Kayakers and boaters charged towards the front of the ship and within minutes, many aggressive protesters were pulled from their vessels and detained, leaving stranded kayaks all throughout the river. The authorities ended up making their own defensive wall between the Fennica and the kayakers. By this point. fewer Green Peace protestors were still suspended from the bridge leaving just enough room on the west side for the Fennica to pass beneath and continue its journey to Alaska. What an amazing scene, especially feeling the energy that surrounded the protesters. The highlight for me was being able to make it to the supply bag for one of the climbers who was suspended below the bridge and drop in some Equal Exchange snacks! Although the ship passed through, I hope that everyone who was part of this protest feels a tremendous sense of accomplishment and pride that they were able to stand up for their beliefs and also inspire countless others along the way. The following post was written by Lincoln Neal, Equal Exchange worker-owner in our Portland, Oregon office. 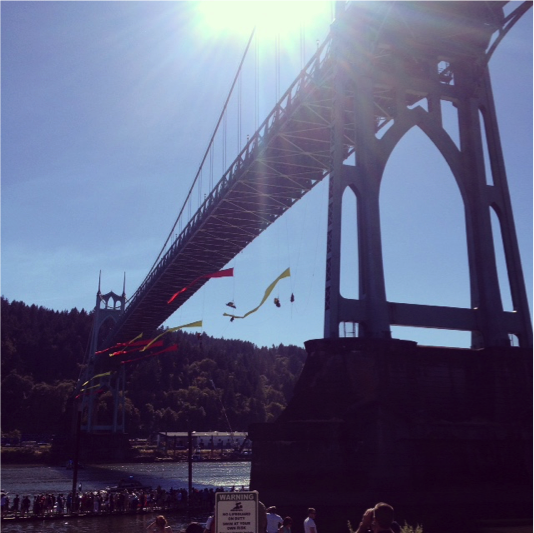 The fight against climate change arrived in our Pacific NW backyard last week when 13 Greenpeace activists suspended themselves 100 feet over the Willamette River from the massive St. Johns Bridge in northwest Portland just four miles up St Helens Rd from our West Coast distribution center. Their goal was to block the newly repaired Shell Oil icebreaker MSV Fennica from leaving the city and travelling to Alaska where it would be used for arctic oil drilling. With the help of a flotilla of kayaktavists, including workers from Equal Exchange, Greenpeace managed to hold the massive 380-foot, 8000-ton ship in check for nearly 40 hours. On Thursday, July 30th Equal Exchange employees Jim Feldmann, Meghan Huebner, Casey Enns and myself loaded a delivery van with 8 cases of trail mix, 20 cases of cashew bars and a couple of gallons of iced tea. The St. Johns Bridge had been closed; and there was no public access to the demonstration from our side of the river. So what would normally be an easy 20-minute drive turned into an hour and a half stretch in slow moving traffic: we of course were glued to the live broadcast of the event. Earlier in the day, unbelievably, the Fennica had been successfully turned back at the bridge. Since then, many more supporters were converging on the scene. We learned from the broadcast that one of the protesters had been lowered down and then removed from the bridge. No explanation was given, but that made four who had come down; leaving only nine activists dangling from the bridge. The park follows the river for about a mile, two hundred feet below the bridge deck. When we arrived, hundreds of people were milling around on the grass and the small beach areas. Families, news people and energetic demonstrators were buzzed by a couple of small drones filming overhead. Just off the shore we saw about 50 kayaks, protected by wooden piles that poked a couple of feet above the water. We left our iced tea at a donations table and walked down to the floating dock beneath the bridge. There, dozens of supporters were chanting encouragement to the kayactivists while also goading the coast guard and police vessels that harassed them. We handed out the trail mix and cashew bars like vendors at a sporting event calling out “Fair Trade! Organic! Snacks!” The dock was beyond capacity and was dipping into the water. Which was good. It was over 100 degrees in Portland that day. We wondered how the protesters hanging from the bridge were faring. We had already seen at least one exhausted, collapsed woman being attended to by paramedics. After handing out the remaining snacks, we jumped down to the beach south of the dock. Meghan, Jim and Casey managed to secure kayaks and canoes and made their way out to the water. Moments later someone to the south started shouting that the Fennica was on the move. Shortly after, the giant icebreaker floated into view. Cops on jet skis were darting around the edge of the river intentionally spraying the kayakers and ramming them. Whenever anyone would resist, such as pushing them away with a paddle, a police boat would move in and try to drag the occupants from their craft. The supporters on the dock began shouting at the police as the Fennica continued to move closer and closer to the bridge. All of a sudden a call went up and the kayakers dove toward the center of the river all at once. The coast guard and police were caught off guard by the chaotic scramble of small boats. The authorities recovered, however, and made a defensive wedge against the protesters, keeping the west side of the river open. With only nine activists now hanging from the bridge, enough room was created for the Fennica to safely pass beneath the St. Johns Bridge. Read Meghan Huebner’s first hand account from one of the kayaks here tomorrow.